This spectacular tour shows you the very best of the island. 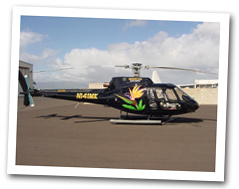 Depending on weather conditions, the pilot will select the most suitable route to show passengers all the "must see" attractions and scenic vistas, from serene Keehi Lagoon and historic Honolulu Harbor, to Aloha Tower, Ala Moana Beach Park, Magic Island and world famous Waikiki Beach. On the eastern end of the island is Hanauma Bay, the remnants of a volcanic crater that is now a marine sanctuary and popular snorkel spot. Up next come the Halona Blowhole, Sandy Beach, Makapuu Point and lighthouse, and colorful Sea Life Park. 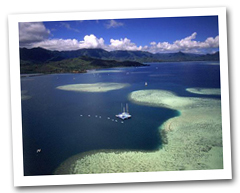 After cruising above the powdery white sands of Waimanalo Beach, the tour continues over the gorgeous coral formations of Kaneohe Bay, distinctive Chinaman's Hat, and then up into "Jurassic Park" valley, where a dozen major motion pictures have been filmed. The highlight of the tour is Sacred Falls, a shear and splendid 1,000-foot cascade. On your way over Oahu's Central Plain, you'll see the world's largest agricultural maze at the Dole Pineapple Plantation and the "birthing stones" of Hawaiian royalty. Your tour concludes with a panoramic vista of Pearl Harbor. Approximate tour time is 45 minutes. Due to enhanced security, we ask guests to please leave their purses, backpacks and other items in their hotel rooms or in the hotel room safe. The only items allowed on the helicopter are cameras and video cameras. All other items must be left behind. Storage lockers are available for a fee. The routes described assume normal trade winds and weather. Pilots reserve the right to alter the flight path of any tour as appropriate for different winds and inclement weather. Weight Policy, Flight Rules, Conditions and Recommendations: This tour has a 96-hour cancellation policy. Customers cancelling flight within 96 hours will be charged for their flight. Open Seating passengers weighing in excess of 250 pounds may be charged an additional fee equal to one-half the cost of one seat. Open Seating passengers weighing more than 300 pounds will be charged for an additional seat. Any two Open Seating passengers from the same reservation whose combined weight exceeds 430 pounds may be required to purchase a comfort seat. An individual First Class passenger’s weight must not exceed 180 pounds; the combined weight of two First Class passengers must not exceed 345 pounds. Making a secure booking online confirms that you comply with these terms and conditions. Practically everyone wants to sit up front where you will get arguably the best view. The front seats are considered "First Class" and are available for a slight additional charge. The combined weight for both parties seated up front cannot exceed 360 pounds. The FAA requires that every passenger over 24 months occupy his or her own seat. However, children younger than that can ride on their parents' lap for free. What happens if it's cloudy?